Turn Windows into a real-time OS by using ADDI-DATA PC boards with RTX drivers! Real-time systems allow time-critical measurement, control and automation tasks. This means a real-time system executes a task within a predefined time. Real-time systems are especially required for automatic rework processes: the products are to be reworked where an error was detected during a previous measurement. If the control system reacts too slowly, the product is not reworked at the correct place. Windows is not a deterministic operating system. Nevertheless, a lot of users also wish to use the trusted platform for measurement and automation tasks. Equipped with the RTX real-time extension, Windows is able to execute time-critical tasks as well as classical tasks. RTX does not intervene in the Windows basis. 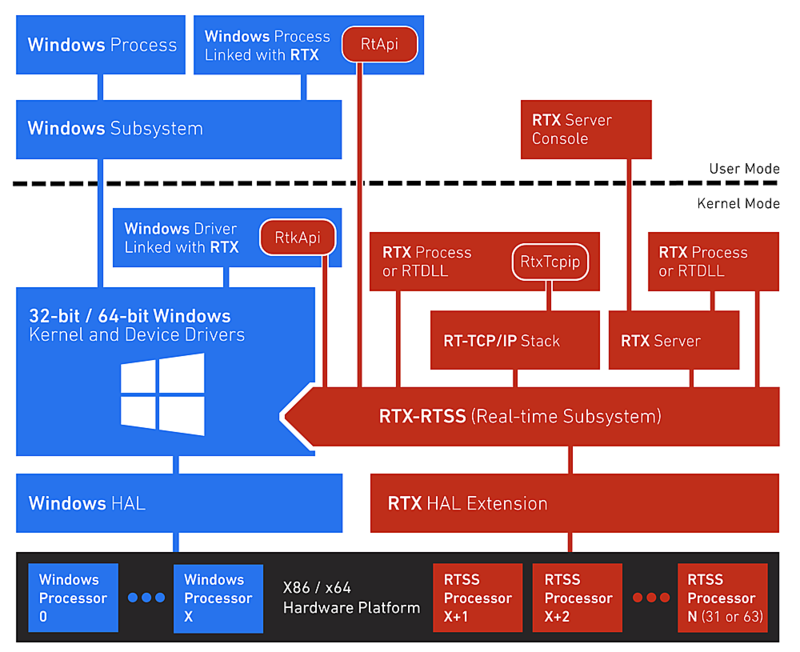 The multi core architecture x86 of Windows allows to assign several processors to RTX in order to realize several real-time applications with one PC. This architecture, also called SMP (Symmetric Multiprocessing), gives direct access to a memory space shared by all cores and thus allows an optimal use of the real-time functions. To reduce debug time and to solve difficulties caused by the interaction between the cores, RTX offers sophisticated and efficient analysis features. This way, you can fully benefit from the advantages of symmetric multiprocessing. RTX and Windows coexist in one single PC. The RTX core allows a direct and exact control of the interrupts, the memory and the I/O in real time; this ensures that tasks are completed within the desired time. Thanks to the broad band communication of the PC and the synchronisation, RTX can easily control the data exchange with Windows in real time. ADDI-DATA offers many PC boards which are supplied with RTX drivers as well as drivers for Windows 8, Windows 7, Windows Vista and Windows XP. The installation is fast and easy. Read our flyer on Real-time Measurement and Control Applications with Windows and RTX!